After moving out of the bach in November and back aboard Bella Via…. we had a short cruise on Bella Via with our friends Dave and Margaret. We had two wonderful and fast sails to and from Waiheke Island in the Hauraki Gulf. We then put Bella Via on Dave and Margaret’s mooring in Opua so that we could spend more time with them at their home in Paihia. 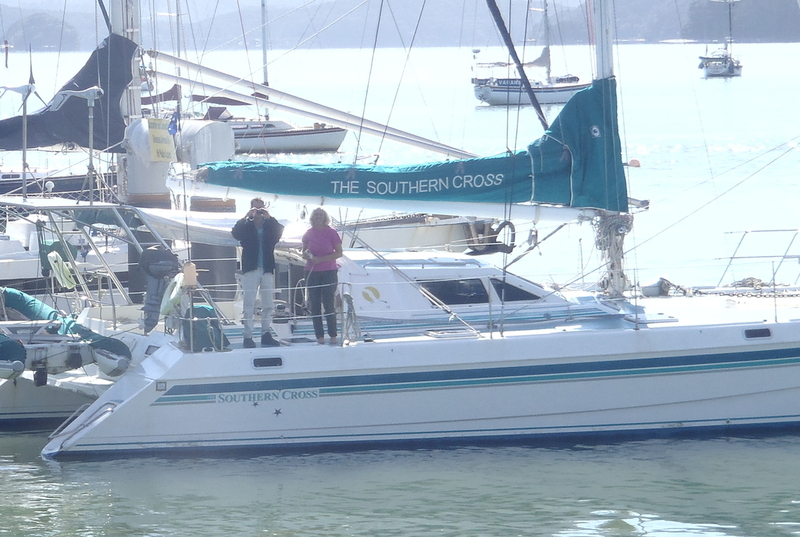 we caught up with Australian friends, Catherine and Peter, from The Southern Cross in Opua. We first met Catherine and Peter in Australia in the Clarence River and last saw them in the Brisbane River in 2008. They were beginning their circumnavigation. Six years later, they arrived in Opua. Here are Catherine and Peter waiting at the Customs dock in Opua for clearance into New Zealand. After clearing, we had two wonderful evenings catching up on each other’s lives over the past six years. after a few weeks in Opua, we worked our way down to Whangarei as we had a haulout booked for December 18. The haulout went smoothly and the boat was waxed and one coat of bottom paint applied before we left the boat for Canada. December 26 – We arrived in Nelson, BC, late in the day and stayed with our son and daughter-in-law for just over four weeks. In that time, our second grandson, Liam Joseph Major, was born. We felt very privileged to be present for the arrival of Liam and share in the joy of Jeremy, Jenn, and big brother Miles as they welcomed him into their home. 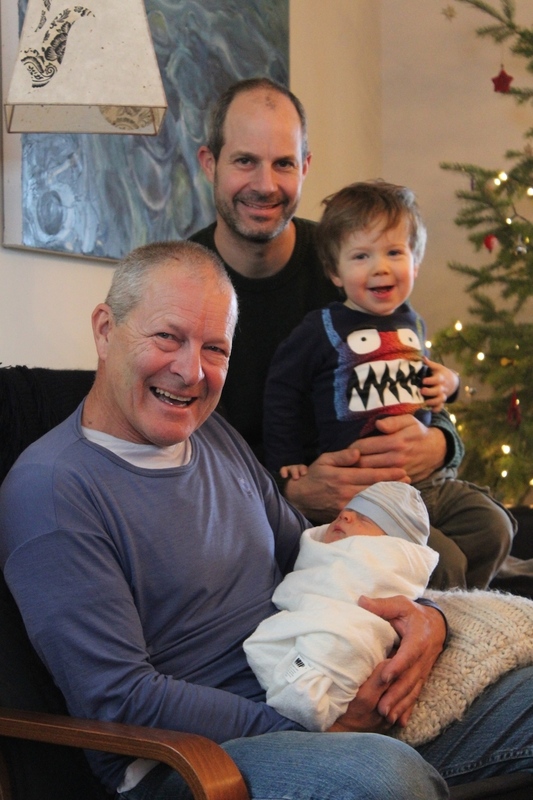 Granddad Paul, Jeremy the Dad, Miles the big brother, and Liam the newborn. Liam was born on January 5, 2015, in the midst of the biggest snowfall we have ever seen. 40 centimetres of snow fell in a 24-hour period and the town of Nelson became a winter wonderland. 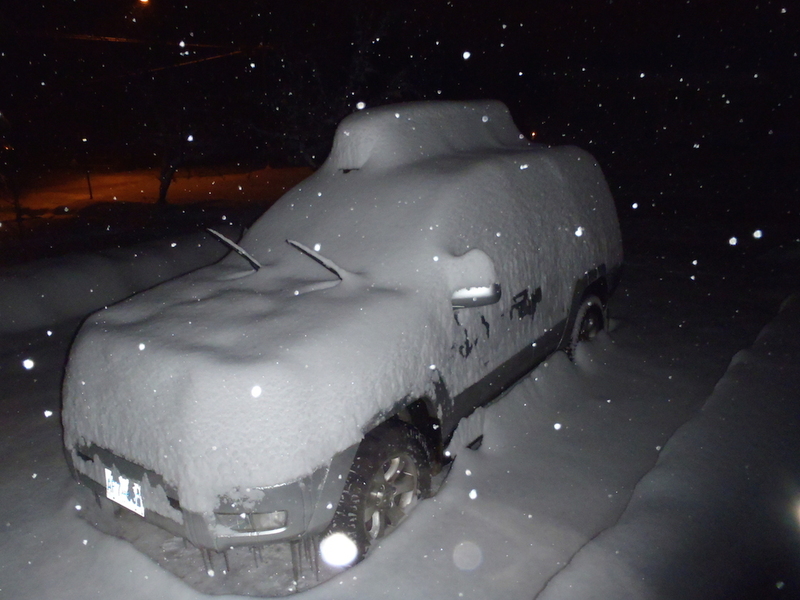 This is Jeremy and Jenn’s car on the morning of the 40 cm snowfall, before Paul started to shovel. 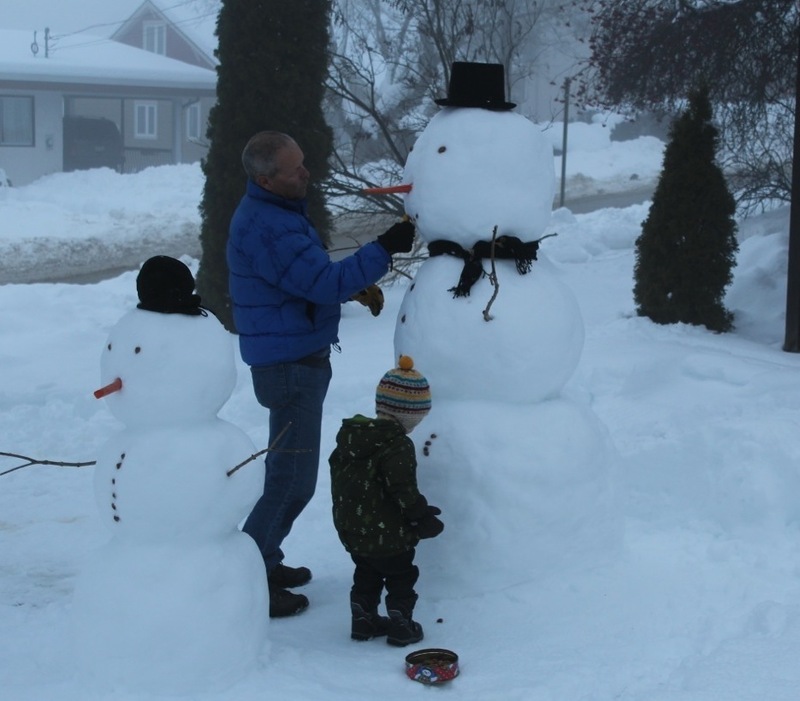 And of course, with that much snow, there has to be the building of snowmen. And, of course, where there is snow, there should be an outdoor ice rink and hockey! 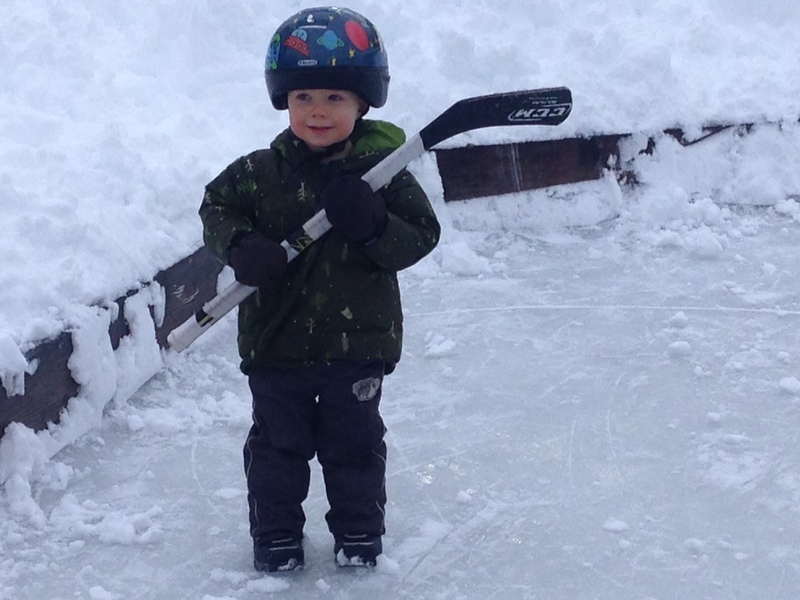 Here is Miles, after his granddad taught him to say, “he shoots, he scores!”. Now, he just needs to learn how to skate. But not until he learns how to ski, his parents say. “ I’m a 65-year-old visitor who has discovered the skating rink at the local Lion’s Club Park in Nelson. Watching the activity on that ice surface prompted me to purchase a new pair of skates after a ten-year lapse from the sport. I got the new skates last Friday and have been on the ice almost every day since. Often times there is a game of shinny in which I am able to participate. I have been to the rink at many different times of the day and usually play with fathers and mothers and their children of various ages. It is such a Canadian tradition. This past Monday I went late in the evening, 8:30 to be precise because I had volunteered to help water the ice at 9:30. When I arrived at the rink there were six older teenagers playing three on three. To score a goal they had to hit the centre back post of the net in the air. Not a skill that I can repeat with anything but luck. While lacing up, it was clear to me that these six were quite good and I wasn’t sure they would invite me to join them, especially because I would be making the teams uneven. When I stepped on the ice with my stick in hand, wobbly on my new skates, one kid said, I’m Matt and that’s Jacob and Jerry, you’ll be on our side. (These are not their real names because I can’t remember their real names.) I thought it was very gracious of this “kid” to welcome me to join their game. It didn’t take me long to realize that I was way out of my league and it was quite entertaining watching them skate circles around me. They grinned with glee as they did so. My own players would deliberately feed me a pass at which point it was obvious that the opposing players would give me some room to make a play or take a shot. It was as if they were playing with a little kid that they wanted to encourage. Once when I tripped and fell to the ice, they stopped playing and asked if I was all right. After forty-five minutes I was exhausted; fortunately it was time to start cleaning the ice in preparation for the watering. When I announced this they cheerfully picked up shovels and with their energy and speed the surface was perfectly cleared in ten minutes. It was near the end of this that one of the kids said something that made me realize who I had been playing with. Two or more of them were teammates who currently play for the Nelson Leafs (a Junior B team). I thanked them for the lesson. They just grinned. Here were a few “kids” who had just lost an away game in Spokane the night before yet found a rink on which they could play a game with no pressure, just for the fun of it. A few days after the evening mentioned in the above letter, Paul met the secretary of the Nelson Leafs, Michelle, at the same outdoor ice rink. Paul happened to mention how much he enjoyed playing with the six players and how impressed he was with these young men. He also mentioned that he would be attending the next at-home game so that he could watch the Leafs play. Michelle offered him a free ticket but Paul declined the offer. 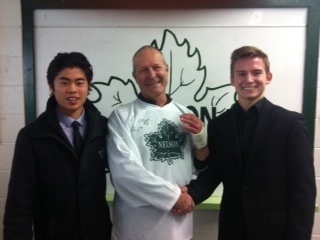 At the game, which Paul attended with our son, Jeremy, Michelle presented Paul with a Nelson Leafs team jersey, signed by a few of the players, as a thank you for the good news article. It was 10 days after Paul’s fall on the rink before we realized that his left hand wasn’t just sprained, with swelling and bruising. An x-ray showed a fracture and we attended the hospital in Trail, BC, so that Paul could have two pins inserted. We said good-bye to Jeremy, Jenn, Miles and Liam on January 29 and flew to New York for a short visit with our daughter Jennifer, and son-in-law Jass. It was a quiet weekend, which we appreciated as we needed the rest after a hectic month with our grandsons. It was also year-end for Jennifer at work, a very busy time. Jenn and Jass did surprise us with tickets to an excellent concert by Ladysmith Black Mambazo, whose music we have enjoyed since Paul Simon’s Graceland album many years ago. On February 2, we flew to Detroit and on to Windsor, Ontario, Canada, where most of our extended family and many friends live. We spent the next month visiting everyone with quite a few days of arranged breakfasts, lunches and dinners. It was a pleasure to see everyone. It was very cold in Windsor and, in fact, most of the east coast of Canada and the USA was experiencing colder than normal temperatures. Windsor broke a previous low temperature record with -26 degrees Celsius. They also had a snowfall of 37 cm in a 24-hour period. On February 26 we went back to New York and spent another four days with Jenn and Jass. This time we had a few outings. We did a tour of art galleries one afternoon and went to the Museum of Natural History the next day, both of which we really enjoyed, especially the show at the Haydon Planetarium. On March 3 we returned to Nelson, BC, for the final few days so that Paul could have the pins removed from his hand. During this visit, he helped Jeremy build a bike shed in the backyard. While he was working, one of the pins broke through the skin and started to work itself out of his left hand. We applied antiseptic and wrapped the site so that he could continue working. By evening, the pin had worked itself out by five mm and was driving him crazy. Paul decided to just pull it out all the way and he did exactly that; and it was painless. After applying more antiseptic and a bandage he called the doctor’s office where he was told that this was normal and that we had treated it appropriately. On March 13, Paul returned to the hospital in Trail to have the remaining pin removed. At this time, Paul’s hand is mostly healed. The doctor told him that he could use it as normal but “not to punch anyone!” A real comedian! 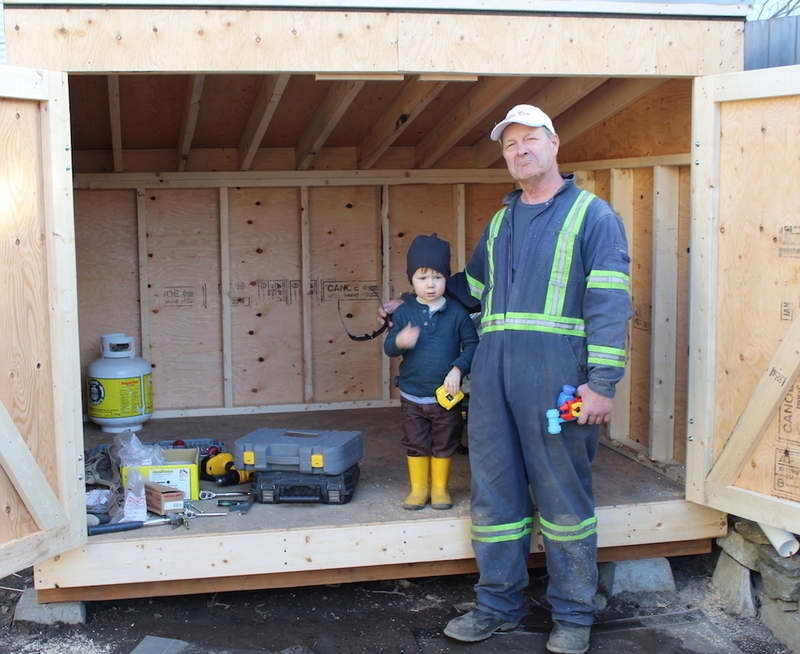 Here are Miles and granddad standing with pride in the doorway of the bike shed. And now, after three months away and thirteen flights across North America and to and from New Zealand we have returned to Bella Via. The weather in New Zealand is delightful. It’s autumn here and it’s warm during the day and cool at night. The boat went back into the water on Wednesday, March 25. We will provision for one month and head over to Great Barrier Island to see our friends, Tony and Carol. But first, we intend to spend a few days at Kawau Island and Waiheke Island in the Hauraki Gulf.